by Robert BoltonThere’s been another steep fall in the number of people doing apprenticeships – although the government claims there are positive signs in the details. At the end of September there were 291,925 apprentices in training, that was 5.6 per cent fewer than at the same time in 2016. Trade apprenticeship commencements were down by 3.2 per cent year on year and non trade commencements down by 5.2 per cent. Among the data were several improvements reflecting the infrastructure boom – there was a 17 per cent increase in machinery operators in training at the end of the reporting period and a 3 per cent increase in construction trades workers. The government says although trade apprenticeships were down year on year, the quarter on quarter result shows an improvement of 4.2 per cent. 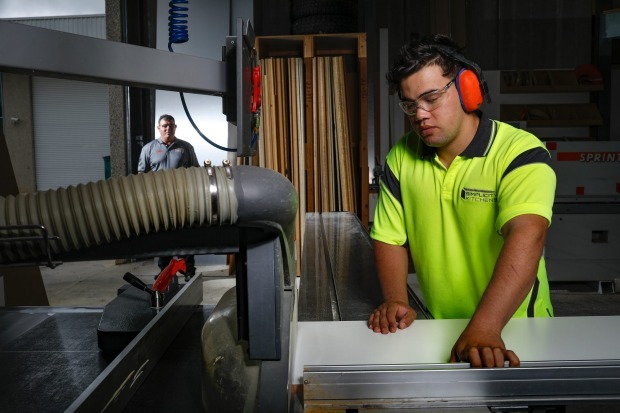 The Business Council of Australia, which has been pushing for an overhaul of the vocational sector said the apprenticeship system needs restoring. Chief executive Jennifer Westacott said this meant restoring employer incentives, reducing unnecessary red tape and removing barriers that prevent employers from hiring apprentices. “We need to get our act together and focus on the vocational system. We need transformational change so Australians can access education and training throughout their lives. The chief executive of the Australian Industry Group, Innes Willox, said the overall trend continues a long-term slide in participation to the lowest level for a decade. “The national level fell below 300,000 for the first time in September 2015. Since December 2015 the quarter levels of participation have ranged between the current figure of 262k and 285k. The minister for vocational education and skills Karen Andrews said the biggest single issue was raising vocational education and training as a good pathway for school leavers – since it has to compete against universities. She said the overall decline showed the importance of the government’s $1.5 billion Skilling Australians Fund to arresting the slide. The fund was announced in 2017 and binds the states to match commonwealth spending. But so far no state government has committed to the agreement. 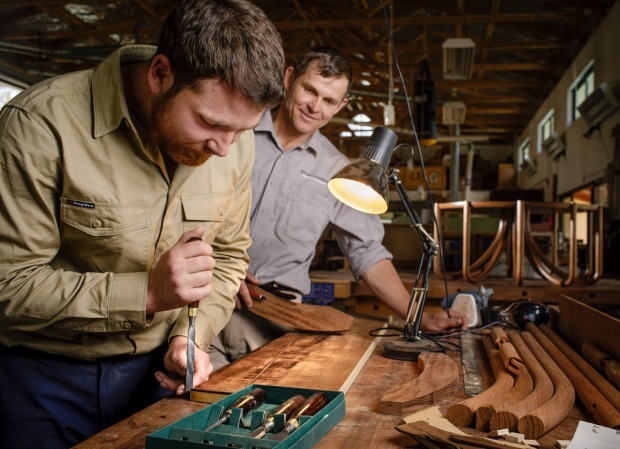 “The Federal Government has funding available right now for states and territories to sign up to the Skilling Australians Fund and submit projects so we can work together to address looming skills shortages in priority industries,” the minister said. But researcher Peter Noonan, from the Mitchell Institute, says more funding is not the issue. He says the decline in apprenticeships reflects wider trends in the labor market. Employers are retaining existing skilled workers rather than putting on new ones. He said the most alarming trend was community and personal service workers where training is down 7 per cent year on year and down 28 per cent compared to 2012. “Ageing and child care are in demand and the accreditation system means people have got to be accredited. You would hope there would be more people coming through getting those qualifications. 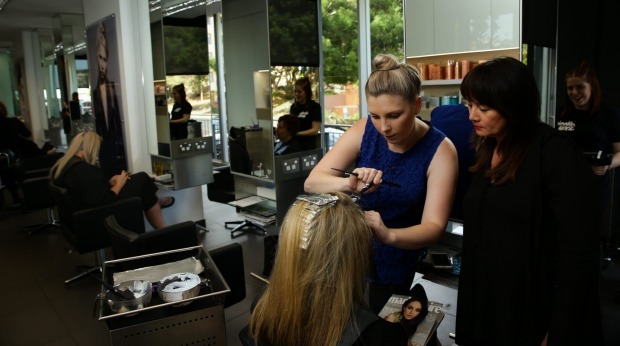 TAFE directors said the Skilling Australians Fund may have come too late. CEO of TAFE Directors Australia Craig Robertson said the problem is employers were walking away from taking on apprentices because the system was too difficult to engage with. 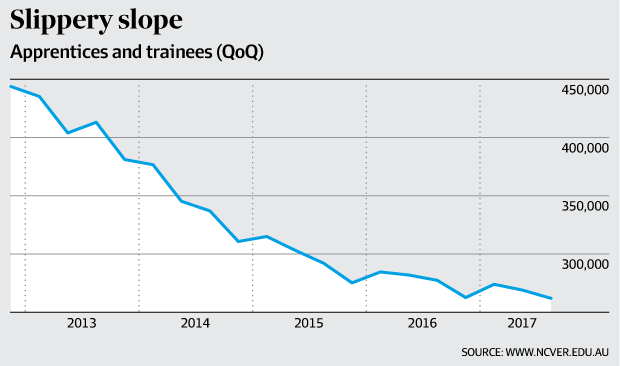 Some sectors have shown specially sharp declines over the longer time frame – including Engineering, ICT and science technicians which are down nearly 70 per cent since 2012 and clerical trainees down 58 per cent. Overall the current number of apprentices in training – at just under 262,000 compares to 443,000 in 2012.